Since 23 January, parties in the platinum strike have been to the CCMA. The Labour Court tried to mediate. Even the Mineral Resources Minister took charge for a couple of weeks. Nothing worked and this week the Association of Mineworkers and Construction Union (AMCU) and the three platinum producers looked as far apart as ever. But it’s always been a game of who will blink first. The miners have been without a wage for almost five months and have blinked, meaning a resolution to the longest and most costly strike in the country’s history might be imminent. But the deal’s not done, yet. By THAPELO LEKGOWA & GREG NICOLSON. Buses are dropping off workers at the Wonderkop Stadium, Marikana, in the morning where hopes are high and hunger is the eyes. As you go towards the stadium you are faced by women carrying babies on their backs and carrying empty containers that they will use if they happen to get a meal. The singing is quiet and energy is at its lowest since Daily Maverick’s been in Marikana. Community members are in conversation on the sidelines of the stadium. Small groups of men are discussing percentages – what is acceptable and what is not. Views differ, which is very common, but the personal struggles are far more different. Workers are talking amongst themselves and are saying, “It looks like today it will end. We will be going back to work.” Some are already on their phones with their loved ones telling them of the possibility. The numbers at AMCU’s mass meeting are not as high as at other rallies. But when people hear there might be a deal the numbers grow. In their faces you can see they can’t wait to hear news, which they associate with a paycheck. It’s clear that they want to be told they’re going back to work. There is one group of about 50 men singing in the scorching winter sun with others just burning in the sun patiently while waiting for AMCU President Joseph Mathunjwa. The workers gather and the mood becomes positive as the word in the street is that the strike is coming to an end. Workers have tried different methods to survive, from skipping meals, eating every second day, and some cutting from three meals to one a day. Workers have been waking up around 4am to be first in the Sassa line. Some even said they spent the night at the at the clinic where Sassa set up. Mathunjwa has been painted as the real force behind the strike at Lonmin, Anglo American Platinum (Amplats), and Impala Platinum (Implats), deepening demands for R12,500 when the mineworkers are suffering. He is taking a mandate from the members, is his response. He’s a leader in a democratic organisation and AMCU would strike as long as the members gave him the mandate. In meetings with members across the platinum belt on Thursday, his claim seems to have been vindicated. In a joint statement, the three companies announced on Thursday a deal has been reached “in principle”. Reports from inside said some workers had told Mathunjwa it’s time to end the strike. Since the strike began, the companies have lost a combined R22.1 billion in earnings and employees R9.8 billion in wages according to platinumwagenegotiations.co.za, which is run by the platinum producers. Government has also felt the pressure, with the strike being the main factor in the recent announcement that GDP had declined by 0.6% quarter-on-quarter. Ratings agencies are set to announce SA’s credit rating on Friday, which could be lowered on the back of the strike and weak growth. An end to the platinum strike would come at the perfect time for President Jacob Zuma, who is set to deliver the State of the Nation address next Tuesday. Details of the deal are still unknown, but are expected to be released soon. Once a deal is signed, the strike’s post-mortem could spell significant change for mining, labour and politics. AMCU has positioned itself as a vanguard of the working class, challenging the ANC and Tripartite Alliance’s position as representing the left. But if it fails to secure the R12,500 demand, will members stick with the union after such a grueling fight, or will they seek new leadership, dissatisfied with the return on their sacrifices? And how will the mining companies respond to secure themselves from the costs of future industrial action? Will we see mechanisation, the mothballing of mines or job losses? 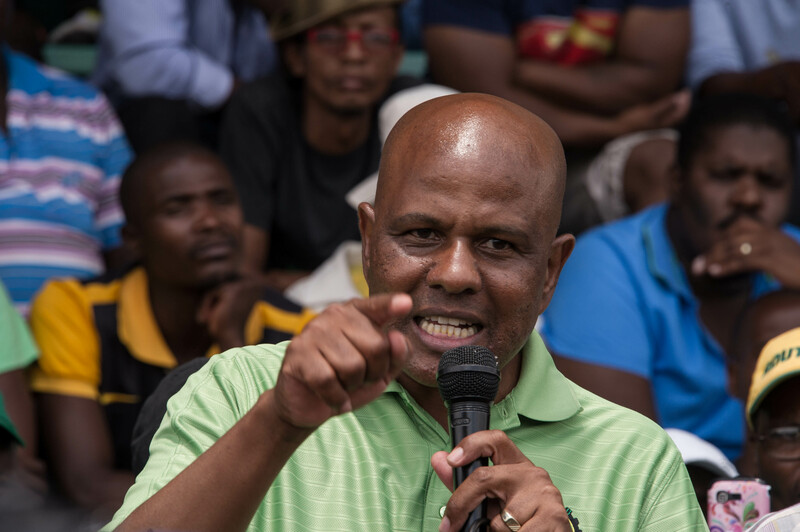 Photo: AMCU’s Joseph Mathunjwa (Thapelo Lekgowa).